Ryan Gander, Travelogue lecture with missing content, 2001. Installation. This work is meditative and fragile. These abstract forms are projected slides belonging to another lecture, Travelogue, where the images have been removed. What is left is the hole of the frame of the slide that light draws upon and projects on the wall. 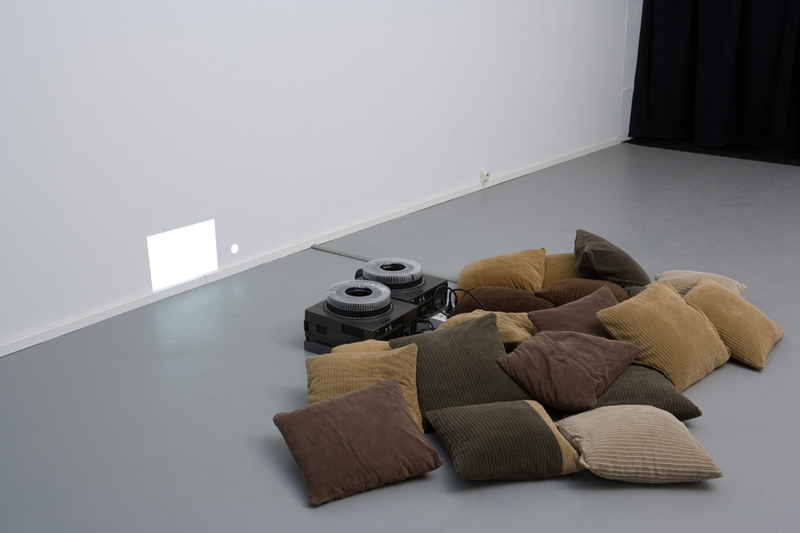 Seated on a group of corduroy cushions, the spectator is invited the follow the ‘spectacle’ of forms that appear and disappear to the rhythm of the two projectors. Ryan Gander presents us with a void which is a space to fill. Here absence is presence. He plays with emptiness and fullness, forms and counter-forms. These voids are proof of removed content, leaving an ‘aura’ which becomes a place for nostalgia or the imagination. Ryan Gander’s practice explores what-ifs, questioning the structural limits and rules of society and being. His work, which ranges from installations, sculptures and photographs, to performative lectures, publications, inventions and intervention, looks at the production of art and culture, to enquire into the processes through which art is perceived and valued. The spirit of his practice centers on development, education, and storytelling, hoping to evoke immediate and honest engagements by the viewer with his narratives. Gander is a collector. His studio is filled with found images, personal images, printed documents and newspaper clippings.